Print Laser Cut Engrave - These are the services we Specialize in! 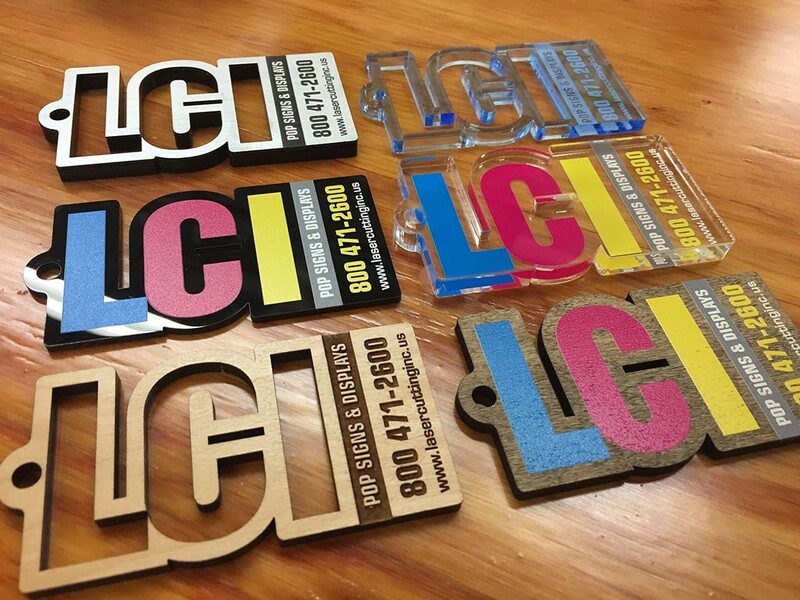 These are some of the most Popular Materials we UV Flatbed Print Laser Cut Engrave at LCI. (Top Left:) We illustrate an example of 1/4″ Laser Cut Black Acrylic w/ a Brushed Aluminum Laminate. Time and time again our customers have picked this as a most popular substrate for Signs and Letters. (Top Right:) First we show an example of Blue Edge Glow translucent Acrylic which is Laser Engraved on the 2nd Surface. We offer this material as a good choice for wall plaques and Donor Panels. Also, in certain situations we add LED’s to make the engraving pop. (Middle Left:) Here we show another example. (1/8″ Thick Black Acrylic w/ CMYK+ww UV Flatbed Print) Printing on Acrylic is our specialty. With our CMYK + white + clear process, we achieve the finest prints resulting in accurate color and scratch resistant durability. (Middle Right:) Finally we have 3/8″ Thick Clear Acrylic. First of all we laser Laser Cut the substrate. Finally we CMYK+ww UV Flatbed Print it. This piece uses the same process as the one on the left, only it is printed on the 2nd Surface. We then back the image with white ink for opaqueness. (Bottom Left:) 1/4″ MDF with Maple Veneer on both sides. First, this piece was laser cut around the contours. Furthermore, it was laser engraved. (Bottom Right:) 1/4″ MDF with Maple Veneer on both sides. This piece was printed with our CMYK+ww UV Flatbed process and then stained dark to achieve contrast. 1. Do I need to supply LCI with a cad file for the project to Print Laser Cut Engrave? 2. What format files do you work with for Flatbed Print Laser Cut Engrave? A: Yes! We can make a production sample before large production for either Flatbed Print Laser Cut Engrave.